The first centrifuge was built by Alexander Prandtl in 1875 as a mean of separating cream from milk. Since then, the laboratory centrifuge developed to be a principal tool in scientific and clinical labs. Cells centrifugation: When there's a need to transfer cells from one solution to another, it is required to the separate of the media of the cells themselves, which are denser than their solution and therefore sediment in the bottom of a tube, which allows a replacement of the media without loosing the cells. Cells, depending on their size, are usually centrifuged at speeds of 300-500G depending on their size. The higher the speed, the faster and better they sediment, however with the cost of a higher physical stress to the cells which might damage or tear them. Differential centrifugation: This method, similarly to cells centrifugation, exploits the concept where denser and larger particles sediment faster. Therefore, brief centrifugation cycles are applied to a tube, and between each cycle, the fraction which has sedimented in the bottom of the tube is collected. A common use to this method is in cell lysated, where the different organelles sink in the tube in different rates, and are collected separately between each centrifugation. Ultrafiltration: A method to purify a solution from proteins up to a certain size, depending on the ultrafiltration tube membrane. These tubes use the centripetal force to push a liquid through a semi-permeable membrane. Different cutoff membranes exist in the marker, from 3000 NMWL to 100K NMWL, which allow every protein up to a certain size to pass the membrane into the disposal compartment, leaving a filtered and concentrated solution in the upper part. It is commonly used to purify and study proteins, concentrate viral vectors such as AAV,Retro and lentivirus, and more. 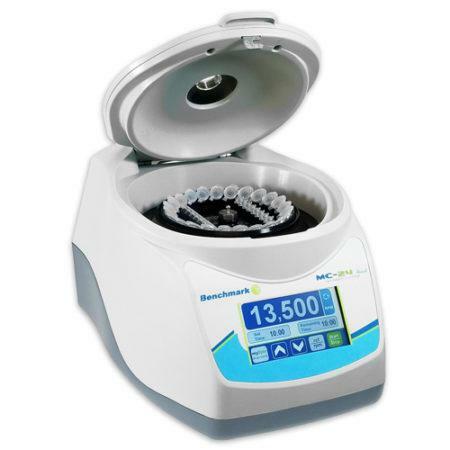 Density gradient separation (Rate-Zonal Centrifugation): This method is mostly used in biology labs to separate tissues and subcellular organelles to their components. Using an application specific dense and viscous medium, particles with different densities are concentrated in defined bands within the gradient medium, which itself has a differential density along the tube. This allows for a better separation of the different components, which are layered in different bands according to their densities. Some methods include a multi layered medium, where the bottom layer is the densest and most concentrated, while the upper layers are lighter. In this case, the particles usually focus on the borderline between the media layers. Of the most popular uses of this concept is whole blood separation to it's different cellular components, which is done by mixing the blood with a dense polysaccharides rich media. In order not to break or mix the different bands that are formed by the centrifugation, a very slow and gradual deacceleration is applied to the tubes, thus maintaining the gentle layers separated.